From my tiny New England town, I am cheering the tiny Kentucky town of Berea. Until this past week, the only thing I could have told you for sure about Kentucky was that Abraham Lincoln was born there. I couldn’t have named Kentucky’s capital (Frankfort). I couldn’t have told you that Berea, Ky., is one of the fastest growing cities in the country, or that it was founded more than 150 years ago as an intentionally interracial town, where blacks and whites would live side by side. And I would not have guessed that in this little slice of Madison County, an entire population would stop its everyday comings and goings and rally behind an interracial couple victimized by racism. On July 7, Damon Dunson and his girlfriend, Melanie Stamper, woke up to find the cars in their driveway spray-painted with racial slurs. According to Dunson, the word n***er was spelled three different ways. Dunson is black; Stamper is white. Most of the messages were directed at her, telling her to leave town. Now, a group of citizens has asked the city council to establish a human rights commission. In doing so, they urged the city not to view the vandalism as an isolated incident, but as an opportunity to examine quieter, more pervasive forms of racism that go unnoticed. Their leaders have heard them: the mayor denounced the act as cowardly and deplorable. The president of Berea College threw the weight of the entire institution behind the couple, writing an open letter in support of them last week. Every state has its stereotypes: Massachusetts is supposedly the land of ivory-tower intellectuals and die-hard liberals. Kentucky is supposedly the land of back-country rednecks and don’t-stop-for-gas-at-night-if-you’re-black racism. But looks can be deceiving. Here is a bluegrass state whose abolitionist founder built a church, school system and entire municipality on the principle of racial “interspersion,” a town whose college board of trustees passed a resolution allowing interracial dating in the 1880s. A former colleague of mine, reflecting on the courage of protesters during the 1960s, once pondered whether she would ever be brave enough to stand up in the face of injustice. The sad truth is, many more people than we’d like to believe lack the courage to stick their necks out when they are witness to bigotry. I don’t want to take sides. I wish you weren’t so angry about this. I’m sorry it happened, but there’s really nothing I can do. That’s as true in the liberal lap of New England as it is in the Kentucky hills. But today, the ordinary people of Berea, Ky., want everyone to know: It is not the truth about them. This entry was written by caramels on maple street, posted on – Jul 25 at , filed under current events, racism. Bookmark the permalink. Follow any comments here with the RSS feed for this post. Post a comment or leave a trackback: Trackback URL. Awesome post! I love learning a new slice of history that makes me see things a little differently. I didn’t know much about Kentucky at all before reading this post. Now I am impressed. Kudos to the town that is strong enough to stand up and refuse to let racism beat it down. This makes me happy to see there are good people still out there with back bones who will stick up for what it right! I love this, it warms my heart and makes me hopeful one day the rest of this country will follow suit. Wonderful post! 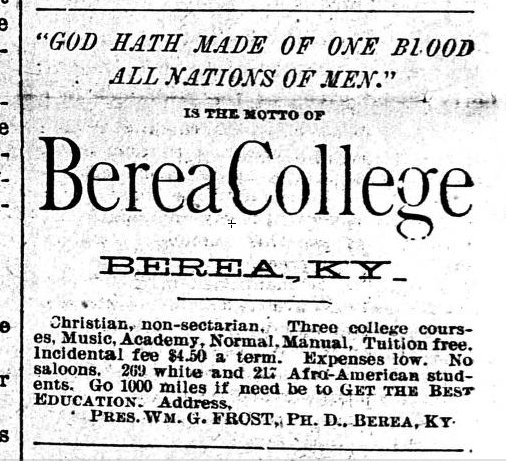 I am an alumnus of Berea College, and hearing about this incident made me sick. I was proud to read of the community response proving once again that Love conquers hate in so many ways! It is as true in Massachusetts as it is in Alabama too. I used to mumble when I told people where I’m from. I’m not proud of the state’s history of violence, but I have to own it. That’s an awesome response to an awful incident. Good for the people and the community who responded. What would it take for the rest of us to live in such a place? All indications are that it would take a lot more than what we’re capable of right now. Thanks so much for the feedback, Allison — it means a lot.